Sauberes Hostel, mit freundlichen Mitarbeitern. Die Location direkt neben der Altstadt Bilbaos ist fantastisch. The area is the best in Bilbao, very intercultural and interesting. Hostel is not well equipped and the kitchen is small and basic. Had a good time though, nice chill out area at the rooftop, but you have to be very quite at night. 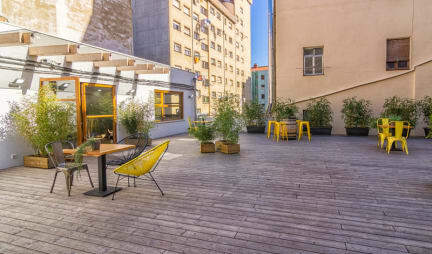 Go to this hostel, it's the most social one in Bilbao! Bcool is a cool, big hostel. Located close to old town and not far from a metro station. The rooms are a little small but the beds are very comfortable and the whole interior of the hostel is new and well equipped. Highlight of the hostel is the big roof top. Its very clean and the common rooms have games and also a relaxing couch area. Only on of the male staff was very impolite and not helpful at all, the rest of the staff was polite and friendly. The breakfast for 4 € is good and diverse. The hostel is okay, staff friendly everything so far clean. The kitchen is just not a kitchen and the atmosphere has not knocked me down but was okay. The hostel is close to the old town and the city is within walking distance. In the beginning I came from a different direction and didn't feel so safe there as a woman. But after I just walked down the street, it quickly calmed down. Ein sehr nettes Hostel mit super frühstücksangebot. Große dachterasse und ordentliche Bäder. Allerdings sind die Zimmer super klein. Ich wusste kaum wo ich meinen großen backpack verstauen soll. Außerdem könnte man das sehr kleine Fenster in dem Zimmer nur kippen, daher war es nachts sehr warm. Die Zimmer waren schön, jedoch für 4 Personen recht klein. Die Badezimmer im Erdgeschoss waren mit Schimmel befallen, da sie keine Fenster und keine ausreichende Belüftung hatten. Der Service war sehr freundlich und die Dachterasse gemütlich und lud zum Verweilen ein. Vom Hostel gelangt man schnell zu Fuß in das alte Stadtzentrum.